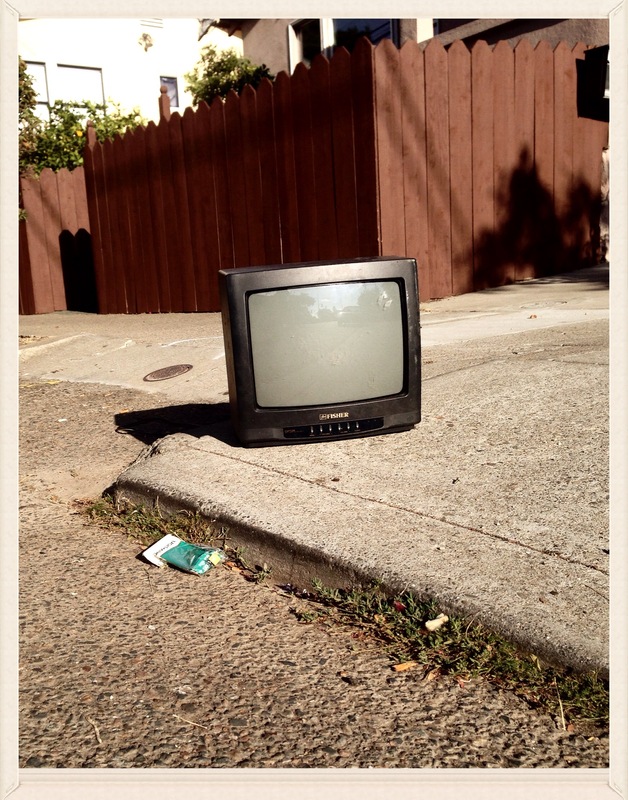 I’m hardly the first guy to ponder the end of television, merely the last. I studied their faces for signs of affectation, but there was none. The freshman said, “watch the Internet” as effortlessly as someone like me would say, “watch television,” and his friend didn’t blink an eye. That was the moment I realized that we may be in a new age, or at least out of the old one. I was sharply aware of the chasm between lookers and watchers. Everyone I knew watched TV. “Looking” at television was an instant giveaway of someone who was too old or anachronistic to embrace the game-changing nature of what TV was. Watching indicates a deeper personal interaction between subject and object– tracking it, engaging it with your full attention; whereas looking suggests something more passive, a physical and emotional disconnect between subject and object. For me, the Internet is still something to be looked at (surfed, actually) rather than watched, but not for the Digital Natives. They watch the Internet the way I watch TV. I was so excited when I stumbled onto the concept of television having a finite lifespan, something with a visible beginning and ending, that I spent a long weekend deciding whether it is best described as the Age of Television or the Era of Television. I consulted several dictionaries for help. What I found was that the term era emphasizes chronology and lineage (the Roman Era), while age is more concept oriented, a term denoting a period centered around some dominant personality, thing, or idea (the Information Age). So although era sounds better on paper, Age of Television seems to be the phrase we’re looking for, with television being that most dominant personality, thing, or idea of the late 20th Century. Whether an age, an era, or even an epoch, you don’t usually know you’re in one until it’s over. Only then do you assign its beginning and end dates. Who can say if the Age of Television has reached its hard out yet, but based on what the Digital Natives are saying, it might be in its terminal fade. The parents look at television. The children watch television. By the way, when we talk about The Age of Television, we are talking about sociology, not technology. Its novel aspect is that it combines Baby Boomers and Gen-Xers into one grouping, a leap of logic that is only possible in hindsight. In real time you would never view the two generations as primarily one and the same. Our generational identities were predicated on how un-like the other one we were. But future historians will look right past that flimsy pretense and see two quarreling siblings under the same MidCentury roof, appearing virtually indistinguishable together in our earnest pre-Information Age innocence. What binds the Boomers and Xers together, and sets them apart from all others, is the primacy of television. 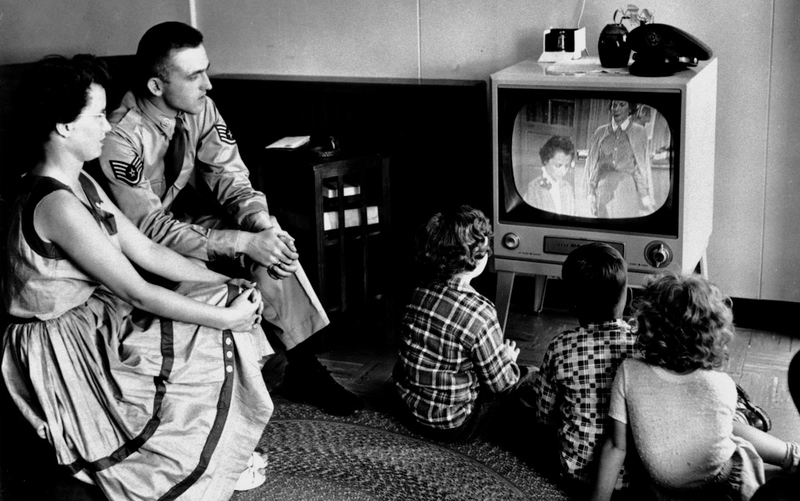 Like Generation X, the Baby Boomers watched television, while their parents looked at television. The Baby Boomers couldn’t really conceive of the end of TV and, until that fall day in 2011, neither could I. Quite the opposite, in fact. Television was the most futuristic thing any of us had ever known. In an era defined by the liberating wonders of household electrical appliances, this device didn’t just do a chore, it rewired our brain circuitry; in many cases becoming our most reliable companion, imaginary best friend, and surrogate parent, all in one. This era between the end of World War II and the rise of the smart phone is a period whose geopolitics will keep future historians busy and future schoolchildren amused at the utter pre-digital naivete of it all. They’ll laugh at us going through life convinced that ours was the Brave New World because we had color television, with zero awareness of the imminent arrival of personal computer technology and the Internet, or the impact they would have. To be sure, the Age of Television is one half of an even larger period, something I call the Analogue Century, which dates roughly from the 1890s to 1990s, and encompasses the advent of all electronic media (film, radio, sound recordings) right up until the moment audio and videotape started becoming scarce on store shelves. By that reckoning, the year 2000 works quite handily as the new Year Zero for this new post-analogue age. Just change B.C. to mean Before Computers, and A.D. to mean After Digital and you’re set. Laugh if you must, but this nomenclature is pretty on the nose, and it places the Age of Television firmly on the B.C. side of history. 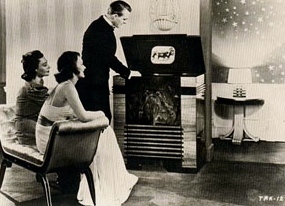 To those who lived it, the 20th Century sure felt like the future, thanks to all the innovations from cars, airplanes, radio and movies, right up to the household electricity that gave us television. “20th Century” even sounded millennially futuristic, but that was deceiving. It was still the 1900s, just another transitional century like the 1800s were–legacy centuries of the Industrial Revolution and the Age of Enlightenment. The real future begins right about now, in the 2000s, with the digitalization of our world and the nearly complete process of miniaturization from desktop computers to handheld devices to smart-cells implanted right into our biology. This is the bigger picture into which the Age of Television fits. 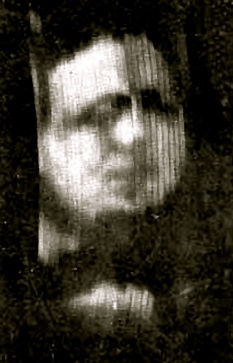 James Baird, inventor of the televisor, in 1925, in what is purported to be the first ever televised image. We have several easily identifiable milestones from which to date the beginning of the Age of Television, all falling within a narrow range of dates. There was Scottish engineer J. L. Baird with his “televisor” in 1925, and Philo T. Farnsworth creating television signals in his San Francisco lab a few years later. Philo T. Farnsworth is doubly iconic because he is a quintessentially wholesome Middle American small-town boy with a name that suggests a Tom Sawyer character in a straw boater hat who puts on Fourth of July shows at town gazebos rather than creating the Brave New World device with the cathode ray tubes, rabbit ears antennae, and radium glow that would end up rewiring our brain circuitry. Another good start-date is the World’s Fair of 1939, where the first commercially available television sets went on sale. World War II put that enterprise on the backburner for a few years, but by 1948, there was regular network TV programming, and over the coming years, television sets would arrive in millions of American homes. 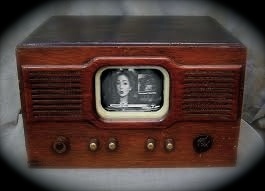 So, we can conservatively estimate the Age of Television to begin in earnest around 1948, when four networks began broadcasting prime time programs TV seven nights a week. But as previously mentioned, the Age of Television is a cultural innovation, not a technological one. The real TV milestones would be the events that dictated the cultural history of the second half of the 20th Century. The Ed Sullivan debuts of Elvis and the Beatles, which awakened the manifest destiny of a generation of teens and preteens that would sweep away three centuries of American puritanical mores. The first televised Presidential debate in 1960 between Nixon and Kennedy. Radio listeners thought Nixon won. TV watchers gave the nod to Kennedy. Guess who got the most votes that year? Have elections ever been the same since? More milestones: The nightly footage from Vietnam-best encapsulated by the triptych of the self-immolating monks in 1964, the GI igniting the straw hut with his Zippo in front of the wailing village woman in 1965, and the summary execution of a blindfolded Vietcong prisoner by a South Vietnamese officer on the streets of Saigon in 1968. The Vietnam War was brought into our living rooms with graphic footage of casual violence like the above every night in living color, making it that much harder for people not to take a position, and opening up a cultural battle on the home front that was unprecedented for an American overseas military excursion into a country the same people had scarcely heard of before. The Sixties ended on something of a high note when America met Kennedy’s ambitious challenge of sending men to the moon, and bringing them back alive. The fact that this monumentally historical event was orchestrated to be broadcast live to a worldwide TV audience surprised no one, and seemed to quietly cement the primacy of the medium of television. What thrilled us was not so much that a man could walk on the moon, but that with television we could see and hear that man walking on the moon. 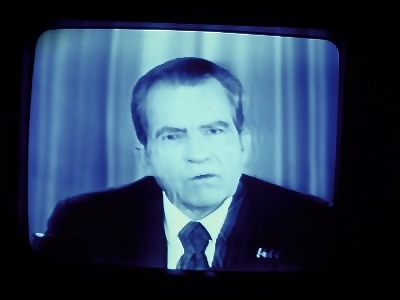 One more TV milestone was reached in 1973 when the Watergate hearings were simulcast in real time over the course of a summer, in what has been described as the world’s first installation of reality TV. Over the next twelve months, people watched the fall of a president from the comfort of their living rooms, and as with the Vietnam War, few were able to emerge from the ordeal without an opinion. Nixon became a four-letter word. “Watergate” became the go-to shaming term for the rest of the decade if not the century, and it all stemmed from a presidential scandal that in hindsight seems relatively tame compared to the lingering bitterness it unleashed. That’s the power of television. After 1974, society settled into a post-Sixties equilibrium. We concluded that not only the wider world, but quite possibly our own nation as well was going to the dogs. We retreated inside to watch our televisions. Watergate had been the last great milestone of TV midwifery. In 1975, Saturday Night Live debuted. From then on, the best stuff on television was not the events of the world that the tube could bring into our living rooms, but the stuff that its writers and producers came up with, stuff like Saturday Night Live, whose writers’ room contained arguably the most intelligent and fertile creative minds of the counterculture at the time. TV was no longer just the medium, it had also become the message. That’s the world I grew up into, and probably you, too, if you’re over 35. I knew nothing of a world where TV wasn’t society’s greatest and also most ubiquitous achievement. Television dominated the cultural landscape like the Great Pyramids dominate the Giza Plateau, omnipresent, electrifying the airspace with awe, wonder, and occasional loathing. A British child who was three years old when Victoria became the queen would have been almost 70 when the crown was passed from Victoria to her son. Although logically, that Briton had to know that one day there would be a new regent, viscerally a post-Victorian world would never feel normal to him. And so it is with us and television. TV is filled with all its establishing milestones, but we could scarcely conceive of an end point. For anyone growing up in the second half of the Twentieth Century, television was always an expanding universe. TV might not have a hard ending the way it had its hard beginning. 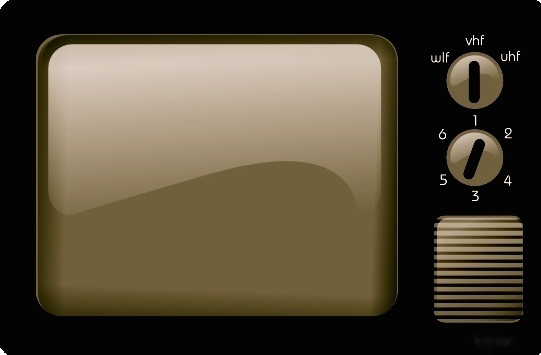 It might just dwindle into ever increasing obscurity, eclipsed bit by bit by the new technologies the way TV itself came to eclipse radio, the technology it evolved from. For those of us who were weaned on television, we will continue to watch our programs until the day we die. 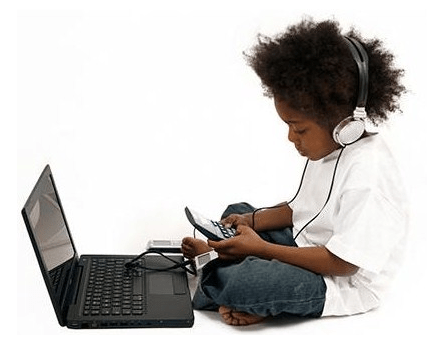 But for the Digital Natives, the Internet is what’s on, while television is the clunky piece of furniture that grandpa remembers fondly, like a Victrola or a player piano. ← Gerald Ford and Fidel Castro. Just Because It’s August.